Located on Merchant’s Row in Randolph’s compact little downtown, Black Krim (the name refers to a variety of Russian heirloom tomato, for those wondering) is basically a small tavern with a decor of wooden floors, quaint decorations, and mismatched furniture that seems to be common through many of central Vermont’s little towns. 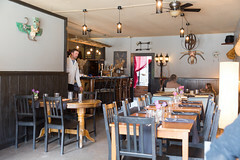 The basic fare is usually “upscale tavern fare focusing on locally-available items”, and, for those that are reading this review, usually only open for dinner. But when I noticed that Black Krim was opening on Easter for brunch, I decided that it would make for a pleasant drive and a different change of pace. Focusing on the brunch menu, the first thing to jump out out at us was a selection of different bloody marys (ranging from classic, to jalapeno, to kimchi). I quickly settled on kimchi (one of my weaknesses) while Carol opted for the jalapeno. Both were quite pleasant: my kimchi version having a particularly bold thai pepper and lemongrass flavor to the drink itself, served up with both pickled carrot and a decent house kimchi. 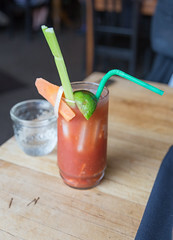 The jalapeno version was similar, with a more Mexican-pepper spicing, but both were a pleasant, well-executed rendition of the classic “brunch” cocktail. 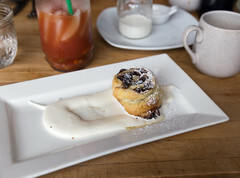 While we were enjoying our cocktails as well as some coffee as a starter, we also ordered a sticky bun. This turned out to be a bit more like a cinnamon roll with cranberries and pistachios than a proper sticky bun (I always expect my sticky buns to be, well, a near mess of sticky caramel), but a pleasant, flaky treat nonetheless, with little bits of cranberry, nut, and flaky pastry in each bite, sopping up a cointreau glaze. I probably wouldn’t have this again, but it was still quite enjoyable. 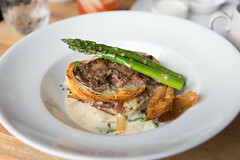 Moving into the main course, I ended up going for the roulade: some local beef flank rolled up with a pesto-like vegetable medley and some sharp cheddar cheese and wrapped up in some puff pastry served over some potatoes and asparagus, this was a good dish: the beef was nice, tender, and flavorful, and the vegetables and cheese combined to give a flavor and texture almost stew-like. With each bite having a bit of the pastry, this was a good dish. Carol, meanwhile, opted for another special, their ham steak and waffles. 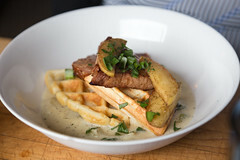 Served up as a thick slab of ham steak with some apples and cheddar over two waffle wedges with a rosemary cream gravy, this was the sort of combination that plays to the same sort of crowd as chicken-and-waffles: a nice savory ham steak coupled with both cheese and some sweet notes from the apples, this set of toppings combined nicely with both the waffle and the cream gravy, for a treat that I wouldn’t mind trying again. So, while I broke one of my major rules coming hear (“Don’t go out to restaurants on Easter!”), between the unusual destination and the good food, I was quite pleased, and resolved to return sometime soon for a swing at their dinner menu.